Photomicrographs of two Caenorhabditis elegans hermaphrodites expressing the TIAR-1 stress-granule RNA-binding protein fused to the green fluorescent protein before and after heat shock. The images were repeated and ordered to form a golden ratio spiral. See Huelgas-Morales et al.. Image courtesy of Gabriela Huelgas-Morales of Universidad Nacional Autónoma de México, México. This summer, GSA is throwing a genetics shindig–The Allied Genetics Conference (TAGC)–to bring geneticists from multiple disciplines together to promote interaction and cross-fertilization among fields. In a way, this meeting extends a current trend: GENETICS authors have been aggregating for some time. Those of us who have been following the journal over more than a few years have probably noticed that the number of authors per paper has been increasing. We thought it might be fun to document this trend. 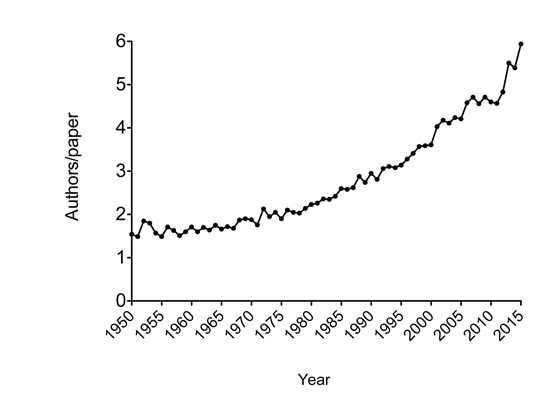 Figure 1 gives the average number of authors per paper in GENETICS by year, from 1950 through 2015. The numbers include all standard research articles. Excluded were Reviews, Perspectives, Commentaries, Notes, Letters to the Editor, and other article types. The trend toward papers with increasing numbers of authors strikes us as dramatic, and it shows no signs of abating. During the 1950s and 60s, most GENETICS papers had one or two authors. 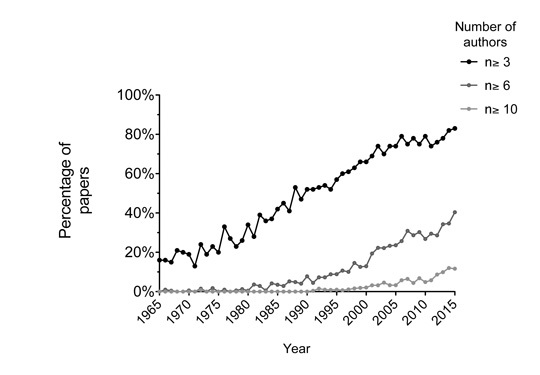 With the advent of high-throughput genomics, we’ve all noticed papers with several dozen authors, but that trend by itself does not appear to account for the overall increase in authors per paper. Figure 2 shows, for 1965 through 2015, the percentage of GENETICS papers by three or more authors, six or more authors, and ten or more authors. Since 1965, all categories have increased: in 2015, only 17% of the papers had one or two authors, 43% had three to five authors, 28% had six to nine authors, and 12% had ten or more authors. We encourage readers to extend these observations to other fields. Others have noted that the number of single-author papers has been declining in the biological sciences (see King, http://sciencewatch.com/articles/single-author-papers-waning-share-output-still-providing-tools-progress). Figure 2. The percentage of GENETICS papers with more than two authors has increased over time. GENETICS papers were classified into three groups: those papers with 3 or more authors (black), those with six or more authors (dark grey) and those with ten or more authors (light gray). We think these data raise two interesting questions: what is driving the aggregation of authors, and when, if ever, is the trend going to level out? We have no idea what the answer to the second question is, but at least part of the answer to the first question seems likely to relate to increasing access to technology, which makes it efficient for researchers with different technological skillsets to collaborate. Examples of this type of collaboration include the use of advanced microscopic modalities or proteomics in combination with genetic analysis. Another example is the use of multiple model systems to demonstrate the conservation of genetic mechanisms. We wonder if increased competition for research funding might somehow drive the pattern of increased research collaboration because of the efficiencies provided by shared production of scientific data. Another possibility is that reviewers of papers are seeing the possibilities for, and requesting, more work. We’ve noticed that the authors of multi-author papers are generally from several different departments: among the 31 GENETICS papers by ten or more authors published in 2015, the average of 15.6 authors per paper were from an average of 5.5 different addresses per paper. We suggest that many co-authors are united by their work on the same organism or the same scientific question rather than by proximity within a department. This idea might provide added impetus for geneticists to attend TAGC to meet those in other disciplines and potentially hatch plans for collaborative work. Robert K. Herman, Gabriela Huelgas-Morales, and David Greenstein are C. elegans researchers in the Department of Genetics, Cell Biology and Development, University of Minnesota, Minneapolis, MN 55455.
very interesting. await more news.